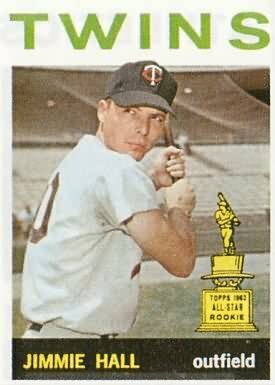 Jimmie Hall signed with the Senators as an 18-year-old in 1956, but didn't make it to the big leagues until three years after the team moved from Washington to Minnesota and became the Twins. As a 25-year-old rookie in 1963 he initially served as a reserve outfielder on a team that had veterans Harmon Killebrew, Bob Allison, and Lenny Green established as starters and struggled early on, hitting just .188 in 80 at-bats through the end of May. Hall got his big break Green went down with an injury in mid-June. It wasn't quite Lou Gehrig replacing Wally Pipp, but Hall stepped in as the starting center fielder and had a huge rookie year. At a time when the league as a whole hit a measly .247/.310/.380 and teams scored just 4.1 runs per game, Hall hit .260/.342/.521 in 571 plate appearances and smacked 33 homers to break Ted Williams' then-record for AL rookies. Despite blasting the most homers ever by an AL rookie and ranking among the league's top 10 in slugging percentage, homers, runs scored, total bases, and OPS, Hall finished just third in the Rookie of the Year balloting behind Gary Peters and Pete Ward. His adjusted OPS+ of 136 in 1963 not only ranked seventh in the AL that season, it's a number that only 15 different Twins hitters have topped in the nearly 50 years since then. What made Hall's rookie campaign particularly impressive was that he ended up with those outstanding overall numbers despite playing sporadically and performing horribly through the first two months. Then from June 1 through the end of the season Hall batted .273/.354/.556 with 31 homers and 77 RBIs in 116 games. Hall's rookie breakout was more than enough for him to supplant Green as the Twins' center fielder going forward. In the 13th game of the next season Hall, Killebrew, Allison, and 25-year-old rookie Tony Oliva hit four consecutive extra-inning homers in a 7-3 win over the A's. While not an outstanding defensive foursome (Allison played mostly first base that season), they combined to blast 138 homers on the year and the Twins led the American League with 221 homers while no other team reached even 190. Despite all that power, the Twins won just 79 games in 1964 because of a mediocre pitching staff and some tough breaks. Hall turned in a solid sophomore season, batting .282/.338/.480 with 25 homers while making his first All-Star team, but was involved in an incident that might have led to his early decline. Playing center field and batting sixth on May 27 versus the Angels he led off the fifth inning and was hit on the cheek by a pitch from southpaw Bo Belinsky. Hall immediately exited the game, but returned to the starting lineup about a week later and then played well for the remainder of the season while wearing a special protective flap on his batting helmet. 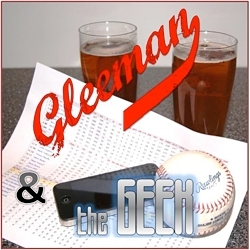 However, there's quite a bit of speculation that the beaning ultimately led to his being timid and ineffective versus left-handed pitchers, and could help explain why he was finished as a productive player by his sixth season. Of course, that theory has some holes in it. First and foremost is that he struggled against southpaws prior to the beaning, like many lefty batters do, hitting just .235/.297/.338 off them as a rookie. Beyond that, whatever negative impact the incident had on his hitting ability certainly didn't show up for several years. In fact, Hall had arguably his best all-around year in 1965, making his second All-Star team and hitting .285/.347/.464 while setting career-highs in batting average, on-base percentage, and RBIs. 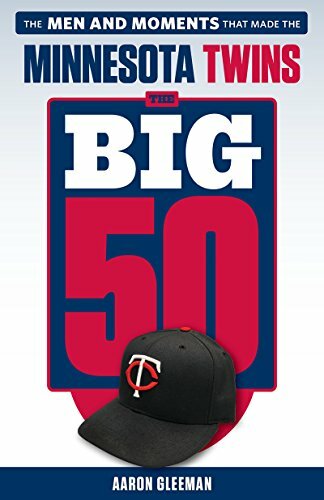 In large part thanks to Hall's excellent third season, the Twins went 102-60 in 1965 to win the American League pennant by seven games over the White Sox and then matched up against the Dodgers in one of the greatest World Series in baseball history. Because the Dodgers' three-man rotation included a pair of dominant lefties in Sandy Koufax and Claude Osteen, manager Sam Mele decided to bench Hall in five of the seven games. The move was somewhat understandable considering how good Koufax and Osteen were and how bad Hall's .240/.272/.333 line against lefties was in 1965. On the other hand, his center field replacement, rookie Joe Nossek, was one of MLB's worst bats and hit just .228/.262/.325 off lefties himself. Hall started the two games righty Don Drysdale pitched, going 1-for-7 with five strikeouts, Nossek went 4-for-20, and Koufax tossed a Game 7 shutout to win the series. He remained a power threat in 1966, homering 20 times in 356 at-bats, but hit .239/.302/.449 for his worst season in four years with the Twins. Hall was phased out in center field, giving way to rookie Ted Uhlaender while spending time in both outfield corners, and was used as mostly a platoon player and bench bat. Shortly after the season he was traded to the Angels along with Don Mincher and Pete Cimino for Dean Chance and Jackie Hernandez. Chance became the Twins' ace for two years and Mincher went on to have a solid post-Twins career. As for Hall, despite being only 29 years old he had exactly one more decent season left in him. Hall batted .249/.318/.404 with 16 homers in 129 games for the Angels in 1967, which doesn't look very good until you consider that the AL hit .236/.300/.351 in what was one of the lowest-scoring periods in MLB history. His modest .722 OPS was good for a nice 117 OPS+. Hall stuck around for another three years, playing for four teams while hitting .208/.277/.297 in 618 plate appearances. He flamed out quickly, but Hall's impact on the Twins was significant. He packed 98 homers into just four seasons in Minnesota despite playing at a time when big offensive numbers were rare, and played a passable center field while doing so. If you adjust his Twins numbers to today's offensive environment, they look something like .285/.340/.525.